"A strategy is an integrated set of actions designed to establish and maintain a sustainable competitive advantage"
An M&A strategy is usually about the non-organic portion of a growth strategy or about the divestiture of non-core activities. In this context "transactions" represent no stand-alone value; they are simply tools for implementing the structural change associated with a strategic option – suitable in some situations and not in others. Not at all!. Managers initiate acquisitions with an incentive to build size rather than value, corporate boards approve transactions without understanding the organization's ability to execute an upcoming integration and advisers support a merger when a strategic alliance could solve the issue with a fraction of the risk and capital. These are just a few examples of poor judgment. They occur because boards and managers have insufficient knowledge of the interface between strategy and M&A – and because advisers focus on methods rather than on client needs. Consequently, matching the right M&A tool to the actual situation is a key to build lasting shareholder value. Read about the mathing of M&A tools to the proper situation here. Also read the separate articles on Developing High Quality Business Models; on Strategy and the proper use of M&A; on Strategic Alliances and Joint Ventures; on Synergies and Poor Judgment; on Financial vs. Industrial Ownership; and on Strategy Implementation and the Lack of Results. See Download Center: White Paper #2: Strategy - and the Proper Use of M&A Tools; White Paper #3: Strategy and Implementation - and the Lack of Results; or White Paper #9: A 15 Step Recipe for Developing Your High-Quality Business Model. Remis AS and Ketil Wig offers advisory and consulting services to foreign owners, handling key priorities related to investments and business units/operational assets in Norway and Scandinavia. Typical strategy assignments are related to handling growth or restructuring dilemmas; or key issues concerning enhancing a strategic position, e.g. 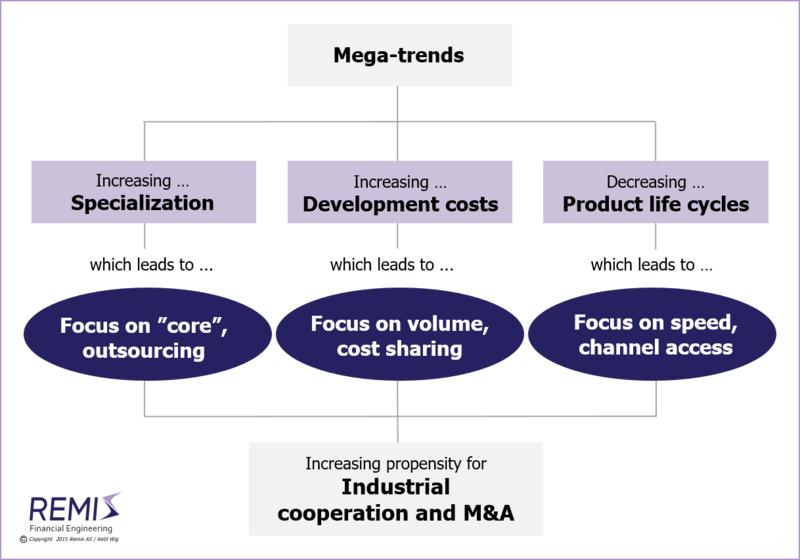 optimizing the busiess portfolio, the value chain or the balance sheet preceding the execution of an acquisition or a merger. 50+ advanced strategy and implementation projects across most industries and value chains. Specialist profile regarding growth strategies, business portfolio optimization, competitive advantage enhancement, and profit improvement plans. Focus on developing robust strategies in highly competitive and "foggy" situations, and the handling of strategically complex and sensitive situations of a high-risk/high-impact nature.